Keynote speaker was Dr Richard Spencer MBE, finalist at the inaugural Global Teacher of the Year and a passionate advocate of lifelong learning. Through the personal stories of its nominees and winners, the Celebration of Learning Awards demonstrated how learning new skills - at all ages and for all abilities – has transformed and enriched people’s lives. Excellent tutors and course providers were also recognised at the event. Kath Fowler (49) from Sunderland has won the “Commitment to Learning” Award. Homeless and from a care background, Kath was withdrawn and reluctant to embark on any formal training, but tutors at Swan Lodge in Sunderland discovered she loved cooking and persuaded her to join in a baking session. Kath enjoyed it so much that within weeks she had signed up for a cookery course. She has now also completed qualifications in maths and English has a certificate in skills for employment, training and personal development. She has gained lots of new skills, mixes well with others and is eager to learn. The icing on the cake is that she’s now gained a new home. James Richardson (23) from Saltburn by the Sea is runner up for the Commitment to Learning Award. James, who is on the autism spectrum, enrolled with Redcar Adult Learning Service in Skills for Employment and Training. Prior to this he had attended Community Learning courses but he always worked alone and was not keen on interaction. However, with gentle encouragement on this course, he started to work with others and eventually carried out a practical cookery demonstration in front of the class, something that would have been unthinkable only a few months earlier. Through learning, James has now challenged his personal obstacles and achieved tasks he thought were impossible. The Tenancy Group from Swan Lodge in Sunderland is a joint winner of the Commitment to Learning – Group Award for a programme which helps homeless people to cook and manage their own homes. They have so much fun on the course that visitors to the centre often ask where all the laughing is coming from! The Hearts and Minds Group from The Cornforth Partnership in Co Durham, is also a joint winner of the Commitment to Learning – Group Award. This group are 10 female survivors of domestic abuse who have made huge progress in their confidence and coping mechanisms. Six out of the ten are now volunteering to help others. Robyn Sterling (24), originally from Dover, but now in Sunderland, is a joint winner of the “Life Changing Learner under 24” award. Robyn always had a dream to become a children’s nurse but lacked the qualifications so left her family in Dover to enrol on an Access to Higher Education programme at Sunderland College. Her hard work and determination paid off and Robyn is now studying Children’s Nursing at university. Jane Morton (16) from Thirsk in North Yorkshire is also a joint winner of the “Life Changing Learner under 24” award.Jane enrolled on a Skills for Employment Training and Personal Development at The Clock in Thirsk. During the course her attitude to learning changed dramatically from negative to committed and positive.She now offers support to others who felt similarly to her at the start of their programme. Philip Taylor (60) from Kendal in Cumbria has won the Life Changing Learner 24+ Award. Philip had not undertaken any paid employment for 14 years as he had been caring for his ailing mother. He was surviving on a very low income and very isolated. Philip embarked on a five week IT course with Cumbria Adult Education so he could apply for jobs both online and offline. He had help with the creation of a CV and then uploaded it onto various jobs websites, whereupon he secured a job as a carer with BUPA and is enjoying his new role. Philip can’t believe how successful he has been so quickly, his confidence has improved, and he’s getting back on track financially. Northumberland Community Voluntary Action in Ashington has won Outstanding Provision of (NOCN) Learning for their “Sowing the Seeds to Success” horticultural project. It was aimed at younger people 14 – 25 who were not in employment, education or training. As well as horticultural training, tree pruning and dry stone walling was also incorporated. The learners all gained a sense of pride in achieving a Level 1 Award in Horticulture but have also attained many other benefits.One student could not make eye contact and had a bad stammer at the start of the programme, and this improved hugely.He also had a severe skin condition which had improved dramatically by the end of the project. Another who had previously never shown any engagement or commitment to learning, completed the course and became “a joy to teach”. Catcote Futures in Hartlepool is runner up for “Outstanding Provision of NOCN Learning”. The organisation develops, delivers, evaluates and evaluates learning programmes for people with learning disabilities in the Hartlepool area.It was formed in 2002 as a pilot with only four students and now has 50 mainly full-time students. Later in 2015, they will have invested about £500,000 in a new resource at Brierton which includes a purpose built bungalow to enable young people to grow their experiences and skills in a realistic setting. They have also invested in three outdoor spaces landscaped to provide a kitchen garden, sensory areas and other outdoor activity areas. The Cornforth Partnership in Co Durham has won “Outstanding Provision of One Awards Learning”. Set up in 1996 by residents with an aim to support the regeneration of the area it worked with 150,000 young people in 2014 alone. In 2009 the Cornforth Partnership decided to offer useful but fun learning units to the community and approached One Awards for guidance.Following a consultation, they came up with some imaginative community education programmes including a project to build hen house on their allotment, with the parents and children looking after the hens, collecting the eggs and then creating a variety of health meals from them. Horticultural skills was another area in which the Cornforth Partnership excelled and a special programme of horticultural learning devised for disabled people was created. 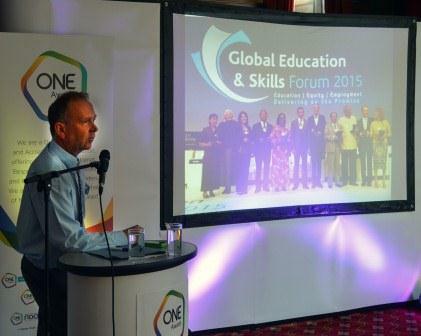 The programmes of learning were all quality assured and accredited by One Awards. Tyneside Foyer in Westgate Road, Newcastle is runner up in the “Outstanding Provision of One Awards Learning” for its provision of home support for hard to reach groups in the community including asylum seekers, learners with ESOL needs and people with learning difficulties.They offer help and assistance with housing, debt, budgeting, lone parent issues, substance misuse, mental health issues and anti-social behaviour. This project has been so successful it now runs nationally throughout the country via Home Group and its Care and Support Group, Stonham. Tutor Debbie Rewcastle from Bishop Auckland College has won the Learner’s Choice Award.She was nominated by four different students. Phrases like “amazingly dedicated” “caring, compassionate and hard-working” “ability to reinstate confidence” “inspirational” and “fantastic mentor” crop up repeatedly in their nomination forms.Debbie has been a tower of strength to these pupils but she equally strives for excellence and demands the highest standards.Many of the students believe it was only down to her confidence in them and her constant encouragement that got them through the course. Exceptional tutors like Debbie can turn lives around and frequently do. Ros Jackson from Sunderland is runner up in the Learner’s Choice Award. Ros is described as an “inspirational tutor” whose commitment to teaching means she organises events and visits way beyond the demands of the Access programme. Hartlepool College has won the “Excellence in the Provision of Access to HE Diplomas. Most of the team members were new to Access and excelled in their implementation of robust systems related to assessment, internal moderation and standardisation. This success has provided very good experiences for the students, as well as sound preparation for higher education in the future. The team has been very well managed and supported by senior members of the College staff. Derwentside College in Consett is runner up for Excellence in the Provision of Access to HE Diplomas. They have shown year on year commitment to the improvement of their Access courses leading to an extremely well-run, high quality Access provision. The effectiveness of this good practice is evident in the quality of teaching and learning experiences for students.Compliance has been high and standards not only been maintained but improved.